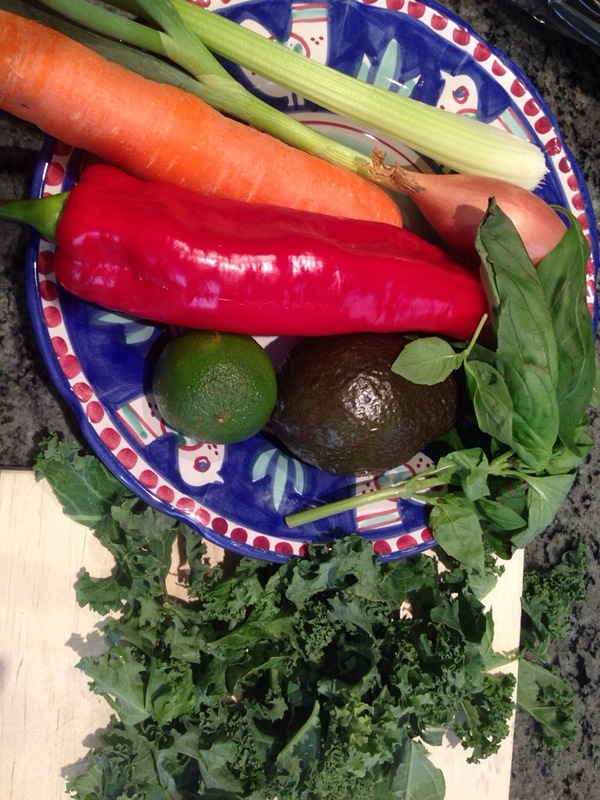 Fresh organic ingredients for the Kale salad. Lately, I’ve been developing somewhat of an obsession with looking at healthy/green food blogs. Not very rock n’ roll, I know, but it is incredibly inspirational and enlightening to see whats trending, not to mention the many talented and creative people who are willing to share their wisdom, recipes and blog techniques to enable others to develop their own voice. Respect! During one of my recent surfing sessions I came across Cookie + Kate, a vegetarian website celebrating the eating and cooking of whole foods. 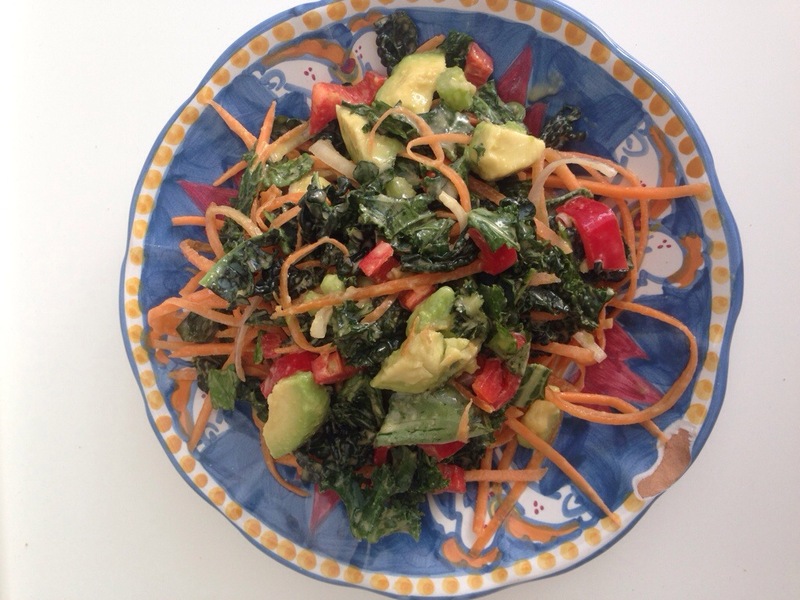 My aim was to search for an inspiring kale recipe and that is how I found Kate’s blog which features one of the best kale salads I’ve ever tasted, Chopped Kale Salad with Edamame, Carrot and Avocado. As I didn’t have all of the ingredients at home, this is a bastardised version that still was a perfect 10 in my book. Kale and other salad ingredients mixed and squeezed, prior to dressing. Remove the tough ribs from the kale and chop the kale leaves into small, bite-sized pieces. Transfer to a mixing bowl. Sprinkle the kale with a dash of sea salt and use your hands to massage the kale by squeezing the leaves in your hands until the kale is a darker green and fragrant. Toss the remaining salad ingredients with the kale. To make the vinaigrette, whisk together all the ingredients until emulsified. Toss the dressing with the salad and serve. Voila!! 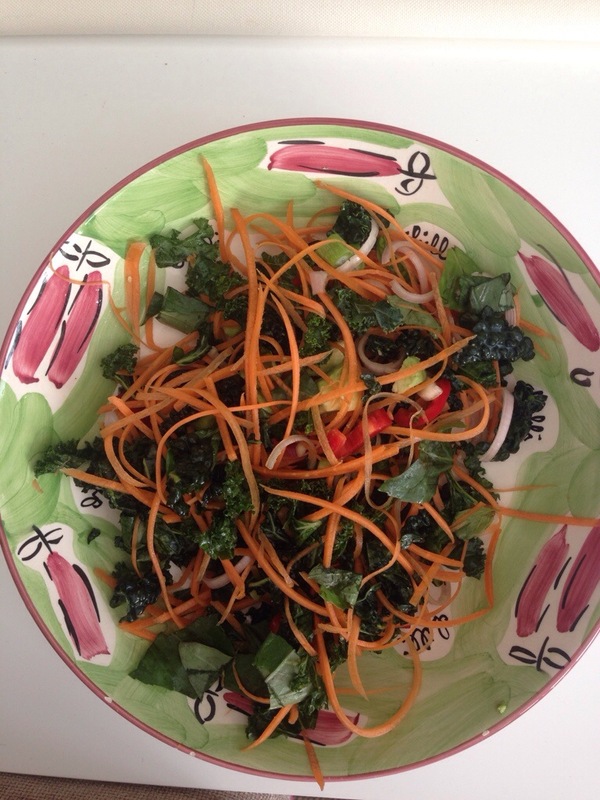 Kate’s salaad mixed with the tamari-ginger vinaigrette – heaven!